Sky Broadband, what they offer and are they any good? Sky packages include a range of TV & broadband bundles from BSkyB, the satellite TV company popular for its movies & sports packs and HD channels. Available in 85% of UK, Sky TV also bundles broadband and calls at attractive pricing. With unlimited broadband and fibre optic broadband plans are available to upgrading and new customers, there are a variety of ways to bundle them with a range of digital TV packs. Users can also order Sky unlimited broadband without subscribing to Sky TV. Sky offers truly unlimited broadband means you need not worry about any hidden limit or fair usage limit while using internet. You can use broadband as much as you like for all your favourite activities like file downloads, streaming HD vidoes or playing online games. Irrespective of how much data you use, you can enjoy fast speeds at all times as Sky neither manages traffic nor reduces speeds at peak times. The new Sky hub wireless router is quite apt for homes with many electrical devices that can potentially interfere with wifi signals. With its Smart Signal technology, Sky hub ensures that the interference from other devices is avoided and the best WiFi channel is automatically chosen to get the strong signals for better performance, wider wireless range and faster speeds. Compatible with both standard, ADSL 2+ and fibre, Sky Hub comes with WiFi Protected Setup (WPS) to connect multiple devices without any hassle. Sky also offers wireless connector which you can use to connect the router to Sky+ box or Sky+HD box without wires. This is free online protection feature for all Sky broadband packages. You can filter web content and block websites which are harmful for your devices and users. Various devices including laptops, smartphones and tablets can be protected. Using parental control, you can choose web content based on age categories. Plus you are also provided with advanced McAfee internet security trial package. Sky Talk offers tailored call plans to broadband customers. Selected bundles come with inclusive calls to UK landlines and mobiles. Plus, you can also choose from call plans – Sky Talk Evenings & Weekends Extra, Sky Talk Anytime Extra or Sky Talk International Extra. Sky offers a new feature Sky Talk Shield which would help you block the calls that you want to avoid. It’s a free feature with Sky Phone. Sky offers fibre optic broadband in areas where it can access BT’s FTTC network which serves as a common platform for providers like TalkTalk and Sky. To get Sky fibre, you will need to first check whether you live in its fibre optic broadband network area. Currently, BT based superfast service that includes Sky is available to more than a third of UK or 13 million Uk homes. Sky offers three fibre packages – Sky Fibre & Fibre Unlimited offer 36Mbps speed (average), while Fibre Unlimited Extra comes with 63Mbps speeds (average). Sky fibre unlimited comes with truly unlimited downloads and is best suited for homes and users that need faster speeds and lot of data for activities like downloading of HD movies & large files and playing online games. Sky offers its broadband customers free, unlimited access to thousands of The Cloud WiFi hotspots across the UK. Connecting up to six devices like laptops and tablets to a Cloud WiFi hotspot, they can just browse the web without the need of mobile internet. Sky also offers WiFi app to iPad, iPod Touch, iPhone or Android smartphone users to access the nearest hotspot to go online, when they are on the go. 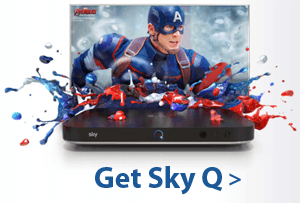 Sky Q TV is the new TV service for Sky broadband customers as well as new customers.It enables users enjoy fluid and seamless viewing of HD & ultra HD TV content with the help of new Sky Q boxes which can also be used as wi-fi hotspots to share Sky broadband around the home. Sky Q offers more advanced TV experience than the Sky+, as the users can access the boxes and Sky TV content wirelessly on multiple devices including tablet and watch recordings & live TV in different rooms seamlessly. The next generation TV service allows you to watch Sky TV in multiples rooms, even on tablets and record up to 4 shows simultaneously while you can watch fifth live, according to Sky. You can subscribe for Sky Q TV bundles without broadband or just mix your favourite TV packs with unlimited broadband or fibre package. Sky TV bundles include the latest Sky Q TV 1TB box which is a giant leap from the old Sky+box. Sky Q app allows you to watch TV channels and live shows on multiple devices including smartphone, laptop and tablet. There are six bundles with all the features that you look out for – entertainment, movies, Sports and over 350 Sky Box Sets. Original Bundle is basic TV pack which includes 270+ channels. Variety Bundle includes 300 TV channels covering more popular TV content. Cinema Bundle includes 270+ channels and 1000+ movies. Complete Bundle includes 3500+ channels, 1000+ movies and 8 Sky sports channels. Is Sky broadband & TV any good? Sky unlimited broadband is one of the best deals as it comes with competitive pricing and excellent features. Although Sky TV offers the best combination of TV channels and the latest TV boxes, it is not as cheap as TalkTalk TV which has recently earned good reviews for good performance. Sky unlimited fibre broadband is not the cheapest option as you can find better deals in the market such as Origin broadband or Plusnet fibre which are quite popular for their excellent customer support , reliable connectivity and speeds.